BMW's performance cars carry one of two badges: M or Alpina. M cars lean towards the raucous side of things, Alpina cars tend to be a bit more gentlemanly. So if you want an M3 to take to the opera and you don't live in America, here is your car, the 2014 BMW Alpina B3 Biturbo. 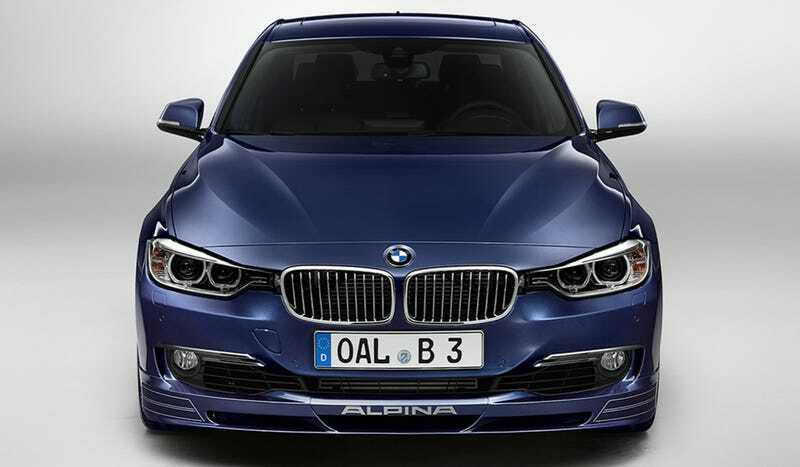 The Alpina B3 Biturbo is based on the 3-series, but with a number of subtle modifications. The body has an aero kit, Alpina graphics, and the now traditional Alpina blue paint, which I'm sure is a massively expensive option. Under the hood, the turbocharged I6 has 410 horsepower and 442 pound-feet of torque which is sent to the rear wheels via an eight speed automatic transmission. That moves the B3 to 62 in a scant 4.2 seconds. Unfortunately, like the previous B3 model, we do not expect this new B3 to be made available in the U.S. (though it's always possible down the line if Alpina sees a business case for it). In the immortal words of Lloyd Christmas: "So you're telling me there's a chance!" Full details on the B3 will be released at the Geneva Motor Show next week.